Lennart Paulsson was born in Sweden 1961. He is living with his family in Stockholm. He has an extensive background in various leading positions within Marketing & Sales. He has been working abroad for the Scandinavian travel conductor Vingresor in Spain and for Sunwing Hotels in Gambia. His main focus area has been within SAS Marketing and Sales in the airline industry developing and maintaining agreement relationship with global agents and corporate customers. He has in addition gained experience as Head of Sales for NEC computer related products in the Nordic countries, as a commercial leader for SAS Ground Services International and as General Manager for SAS in India. He has achieved large experience to get best effect and result from meetings. He is working with a strategic mindset facilitating large meetings and conferences in planning, execution and evaluation. 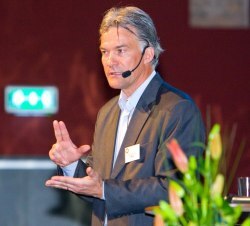 He started his own company P&P Meetings c/o Paulsson and Partners AB, Ltd, in 2009, to act as full-time moderator. He is author of the book The optimal meeting, published in 2013. He is organizer and moderator of larger seminars such as Objective Summit and Presentation Summit.